Publisher: Atari, Inc., Telegames, Inc. 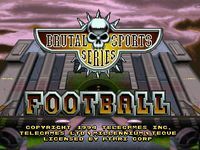 Brutal Sport Football is a sports video game that was released in 1993 by Millennium Interactive Ltd. It features an oval ball which can be thrown or kicked, often resulting in unusual up-and-under type kicks. The gameplay is fast and flowing, and has one rule - if you can't get the ball, get the man, and decapitate him if possible. There's a lot of blood and flailing limbs, giving things a gruesomely humorous edge. There are four leagues to progress through. Source: Wikipedia, "Brutal Sports Football," available under the CC-BY-SA License.